BARCELONA.- It is now 75 years since the inauguration of the Museu d’Art de Catalunya, and the MNAC is celebrating it by bringing together 75 masterpieces of Catalan art belonging to private collections, Catalan, European and American museums, and ecclesiastic patrimony. The show enables us to journey through the history of Catalan art from the Middle Ages to the twentieth century, through works of great artistic quality from the Romanesque, Gothic, Renaissance and Baroque periods, the nineteenth century, and the first three decades of the twentieth century. Exceptionally, some of these works have left their usual place in the churches and cathedrals of Catalonia for the first time to be included in this commemorative exhibition. Some, like the Beget Majesty, a major work of Catalan Romanesque sculpture, or the great Gothic altarpiece of the Virgin of L’Escala by Joan Antigó, are even abandoning for a few months their liturgical function in the church of Sant Cristòfor in Beget, a place of pilgrimage, and the monastery church of Sant Esteve in Banyoles, respectively – an occasion that has been taken advantage of to carry out the restoration of both works. At the same time, the exhibition has made it possible for very important pieces that, for a variety of reasons, are located outside our frontiers to temporarily return to Catalonia, like Pere Oller’s relief from the tomb of King Ferdinand I of Antequera, originally in the monastery of Poblet and now in the Musée du Louvre; an Annunciation by Bernat Martorell from the Musée des beaux-arts in Montreal; Mediterranean, by Aristides Maillol, from the Musée d’Orsay; Picasso’s The Sleepy Drinker from the Kunstmuseum in Bern, or The Farmer’s Wife by Joan Miró from the Centre Georges Pompidou, to mention but a few. 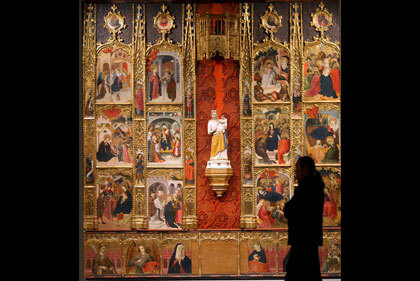 Equally important is the presence of works from Catalan institutions and museums, like the embroidery of Saint George and the Princess from the chapel in the Palau de la Generalitat; the embroidered frontal of Jesus and the Evangelists from the Museu Episcopal de Vic, or Marià Fortuny’s The Carpet Seller from the Museu de Montserrat, among many others. In short, the celebration of the 75th anniversary of the opening of the Museum of Catalan Art gives the MNAC the opportunity to house for a few months this most important and unlikely to be repeated selection of Guests of Honour. The paintings of Saint Catherine from La Seu d’Urgell are a late but extraordinary example of Catalan Romanesque painting. Conceived as the mural decoration of one of the chapels in the cathedral of La Seu, they were rediscovered at the beginning of the 20th century and removed and sold in three separate parts on the international antiques market. These three parts are today conserved in the MNAC, the MEV and the Abegg Foundation in Switzerland. The paintings are an example of the transformations that took place in Catalan Romanesque painting in the middle of the 13th century, when it felt the impact of the French Linear Gothic style. They are associated with the patronage of Bishop Ponç de Vilamur (1230-1257), a distinguished combatant of the Cathar heresy in the diocese of Urgell. The prominence in the paintings of Saint Catherine has to be understood in the context of this circumstance, for the saint was the model par excellence of anti-heretical preaching and the patron of the Dominican order, which had come into being precisely to combat Catharism. The exhibition, moreover, explains to us the technique, known as strappo, for the removal of mural paintings: during the 1920s and 30s it was used to systematically remove the major groups of Romanesque mural paintings conserved in Catalonia. The show is part of the project to reunite dispersed groups of Catalan Romanesque art, begun by the MEV and the MNAC in 2008 with the exhibition The Painted Sky. The Tost Baldachin. Now with The Wise Princess we have the opportunity to enjoy the whole group of paintings of Saint Catherine, presented together for the first time since they were removed.